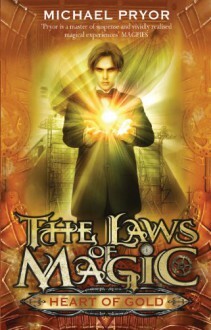 Magical genius Aubrey Fitzwilliam is about to become involved in a convoluted series of adventures . . . again At a loss after finishing their end-of-year exams, Aubrey and George travel to the Gallian capital, Lutetia, where it so happens that the lovely Caroline is studying natural history. Aubrey wants to pursue a cure for his condition—though his family has other ideas, and he's soon burdened with a royal mystery to solve, old letters to procure, a missing ornithologist to locate, and a spot of diplomatic espionage. These tasks should keep Aubrey occupied—but that would be underestimating his sense of curiosity and uncanny knack of being in the wrong place at the wrong time. Someone is stealing people's souls and turning them into mindless monsters, and the country's magical lifeline, the Heart of Gold, has been stolen, leaving the city in chaos. Aubrey, George, and a somewhat reluctant Caroline are on the case in this engaging read.